We all know that practice makes perfect. Step-wise tasks requiring many distinct thoughts become automatic through repetition . All these benefits mean success in the classroom, higher test scores and greater success later in life. So how do you keep repetition from being drudgery? Forcing more "requirements" into homework or the daily routine can have a negative effect on students - and their parents. 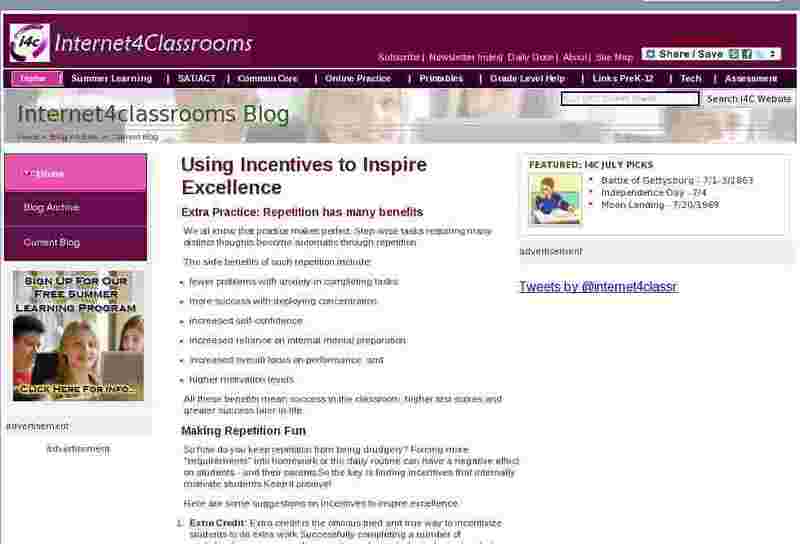 So the key is finding incentives that internally motivate students. Keep it positive! Extra Credit: Extra credit is the obvious tried and true way to incentivize students to do extra work. Successfully completing a number of worksheets, quizzes or online practice sets can help students decide to go above and beyond to learn for just a small adjustments in their grades. Small Individual Prizes: Whether it's stickers, school supplies, cheap medals, or a point system that can be redeemed for something of value later; small individual prizes can lead to motivation and an amazing amount of work product during a single classroom period or over a period of days. School Partner Prizes: Schools normally have many community partners who offer items as prizes or rewards for success in the classroom. At my local high school it seems like students will do almost anything for food, and coupons for a free sandwich at the local Chick Fil-A across the street can be used for almost anything on short notice, from filling the stadium at sports events to stimulating high levels of competition in the classroom. Class Privileges and Special Passes: Earning a free homework pass is always a big incentive. So are rewards like having lunch with a teacher, having free time on the computer, or being a special classroom helper. Long Term Contests: Break out your bar charts and markers to show incremental progress toward a long term goal! As students see the chart area next to their name filling up with more and more ink to show accomplishment, it spurs them onward to keep going to fill it up to 100%. Tee Shirts and Awards for Sustained Achievement: One of the most effective sports incentives program I have seen involving repetition was to get a t-shirt for joining the 25,000 touch "wall ball" club in lacrosse. This involved passing and catching against a solid wall or rebounder for 10 minutes a day for 3 months. At 30 passes per minute for 10 minutes a day, that is 300 touches per day. Do that for 30 days - a month, and you've had 9,000 touches. Do that for 2-3 months during a standard lacrosse season and you'll reach 25,000 touches. Lots of pride (as well as skill improvemen)t just to be able to wear the special 25,000 Touch Club t-shirt. You could just as easily do this with math practice or SAT vocabulary practice as with sports skills. Online Practice: This is a new section of our website that offers thousands of 10 question quizzes on Common Core math skills from Kindergarten through Grade 6. At the end of each quiz there is a results page that can be printed or emailed to a teacher for keeping track of progress. This is a great way to utilize free time in the classroom (or a computer at home) to practice to perfection. You can find the online practice quizzes here: http://www.internet4classrooms.com/online_practice. Printables: If online access is a problem, you can always hand out printable worksheets for repetitive practice of common core skills from Kindergarten through Grade 6. The printable worksheets can be found here: http://www.internet4classrooms.com/printables. An online answer key can be requested by teachers here: http://www.internet4classrooms.com/printables/common_core/answer_key.htm.